The goal of Liftoff is to reduce startup time for WebAssembly-based apps by generating code as fast as possible. 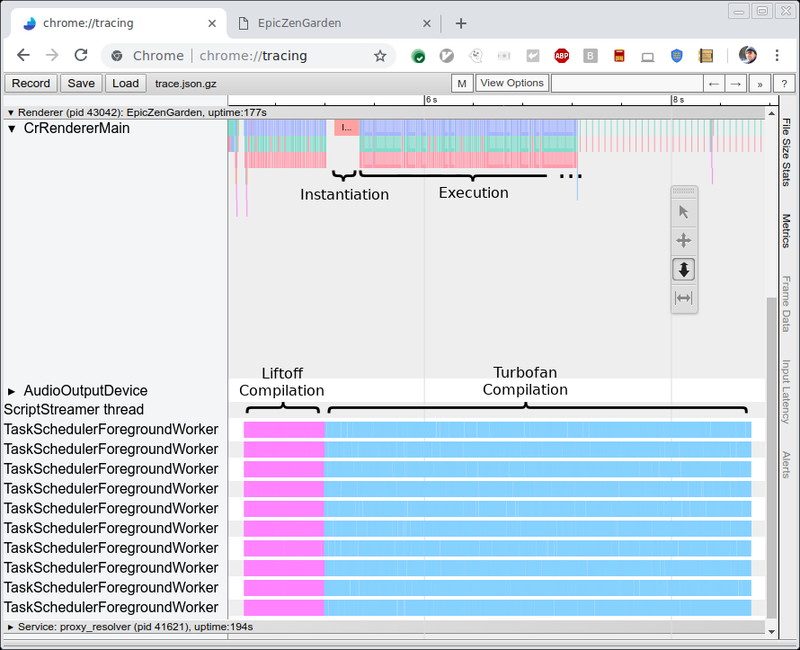 Code quality is secondary, as hot code will eventually be recompiled with Turbofan anyway.. Liftoff avoids the time and memory overhead of constructing an IR and generates machine code in a single pass over the bytecode of a WebAssembly function. The picture below shows the trace of compiling and executing the EpicZenGarden benchmark. It shows that right after Liftoff compilation we can instantiate the WebAssembly module and start executing it. TurboFan compilation still takes several more seconds, so during that tier-up period the observed execution performance will gradually increase since individual TurboFan functions will be used as soon as they are finished. Port Liftoff to arm and arm64 to also use it on mobile devices.Currently, Liftoff is only implemented for Intel platforms (32 and 64 bit), which mostly captures desktop use cases. In order to also reach mobile users, we will port Liftoff to more architectures. Implement dynamic tier-up for mobile devices.Since mobile devices tend to have much less memory available than desktop systems, we need to adapt our tiering strategy for these devices. Just recompiling all functions with TurboFan easily doubles the memory needed to hold all code, at least temporarily (until Liftoff code is discarded). Instead, we are experimenting with a combination of lazy compilation with Liftoff and dynamic tier-up of hot functions in TurboFan. Improve performance of Liftoff code generation.The first iteration of an implementation is rarely the best one. There are several things which can be tuned to speed up the compilation speed of Liftoff even more. This will gradually happen over the next releases. Improve performance of Liftoff code.Apart from the compiler itself, the size and speed of the generated code can also be improved. This will also happen gradually over the next releases.